Egypt: Maher Girgis Tawfiq, a 45-year-old Christian father-of-four, died under mysterious circumstances after he went to the local police station to complain about threats from a Muslim. “[A]round midnight,” says the report, “his wife received a call from the police, telling her that her husband had fainted and been transferred to hospital in a critical condition. The family rushed to the hospital, where they were told that Tawfiq had died at the reception of the emergency department. The police told local media that the Copt had died after falling into a coma due to his diabetes, but his family say he was not diabetic and that they believe he was murdered.” “We headed to the morgue to see Maher’s body and noticed some bruises on different parts of it—a blue bruise at the back of his neck, his lips turned blue, and we saw white foam coming out of his mouth,” said his cousin. “There was also blood in his pupils,” adds George, the slain’s brother-in-law: “A group of police officers threatened Maher’s brothers that if they insisted that he was killed at the police station or demanded an autopsy, they would receive charges, meaning the police would fabricate charges against them…. I will not find consolation until the perpetrators are held accountable. We want to feel that we live under the rule of law, with justice and equality, and not in a state of repression…” This is not the first case of its kind. A year earlier, another Christian man died while in custody. Egyptian police said he committed suicide, though his body also bore marks of torture. Nigeria: Among the many Christians slaughtered in the ongoing jihad, six were killed—and their church and twenty other buildings torched—during an early morning jihadi raid on Sunday, July 1. In a separate incident, a pastor, his wife, and another Christian leader were murdered by Islamic Fulani herdsmen. They were traveling home after visiting relatives when the terrorists ambushed and opened fire on them. The married couple left behind eight children; the other Christian leader left behind a wife and three children. 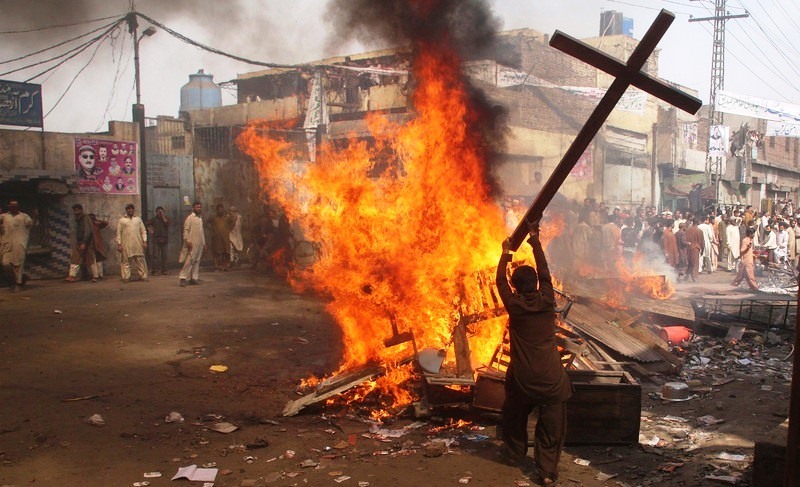 In a separate incident, six more Christians were slaughtered. Greece: A Muslim mob attacked seven Iranian converts to Christianity at a refugee camp, as police stood by and watched. According to the report, the Christians “met as a small group together in one of the Conex containers they were housed in, gathering a few others. Somehow, they came to the attention of the other camp residents… a mob formed on Sunday night as they were holding a Bible Study meeting. The mob attacked them, threatening them with knives and beating the men, resulting in hospitalization for two of them. The two women and two young children were also threatened with knives. Petrol was poured into their Conex. They were called ‘kaffirs’ [infidels] and told to leave the camp. One of the men had a previous heart condition and the attack caused him to pass out. An ambulance was called but the mob tried to prevent its entry into the camp. The Greek police present did nothing, being massively outnumbered by the mob of 30-40 people.” “Before I even woke up for my work, (a lady) called me and told me she was in the University Hospital because she and her husband were assaulted by a group of Muslims,” recalls Pastor Apostolos Theodorakos of the Free Evangelical Church in Larissa: “I ran into the hospital and I found this beloved soul with her child, terrified, with jabs…. [A] group of 30-40 people had come… accusing them of being Christians and going to church. In fact, one took a liquid inside the container and someone tried to (ignite a) fire.” All of the victims of the attack have since fled to a safe house. Uganda: Muslim death threats to a former Muslim turned Christian pastor and his children caused him to stop constructing a church on his land and flee. According to the report, “The 55-year-old pastor had resettled his family in Mazuba five years ago after fleeing persecution by Muslims in Sironko village… In April, Muslims in Mazuba noticed that some Muslims had become Christians and were attending his church… Word that he was a convert from Islam spread quickly, and Muslim schoolchildren began bullying the pastor’s eight children… As area Muslims threatened to kill his children, the pastor and his wife felt compelled to send them to a boarding school in another town. At beginning of the year Pastor Budallah donated a part of his land for construction of a church building. After walls had been built, however, area Muslims … put a stop to construction.” That did not stop the threats: “We know your tricks, that your intention of building the church is for you to convert our members to Christianity,” reads one letter. “If you continue building the church, then you are risking your life as well as the life of your church members.” The pastor’s Muslim relatives also continued to send him threatening messages: “You have refused to come back home [Sironko], and we hear that you have started building a church for infidels,” a text message said. “Know that Allah is going to deal with you soon, and you will not finish it nor pray in it.” “The church members are now living in great fear for their lives and have stopped attending church services,” says the pastor. Separately, “Irate Muslims” hurled stones at and knocked out a Christian pastor after he apparently shamed his Muslim opponent in a public debate. According to the report, on June 21, “A stone struck pastor Tom Palapande, 38, in the head during an open-air debate …with area Muslims about Islamic and Christian scriptures, the Trinity and the Sonship of Jesus, among other topics…. [I]n the fourth debate about Jesus as the Son of God, a sheikh found himself ill-prepared and left in the middle of the event… Embarrassed Muslims in the crowd responded by throwing stones at Pastor Palapande and shouting the jihadist chant, ‘Allah akbar,’ [Allah is greater]… A big stone hit the pastor’s forehead, and the stones as well injured three other church leaders who were close to the pastor at the podium…” After regaining consciousness in a clinic and being transferred to a hospital in Mbale, the pastor said, “This is not the first time when Muslims attacked us, especially when they lost debates.” Uganda is a Christian-majority nation; Muslims make up approximately 12 percent of the population. Egypt: Newly appointed Minister of Health, Dr. Hala Ziyad, issued an ordinance that requires all doctors to recite daily an Islamic version of the Hippocratic Oath, so that hospitalized Egyptians hear it. According to the report, the oath “contains wording that is not unlike the Islamic confession of faith… The problematic section comes at the very end, where the oath-takers recite ‘Allah and his Prophet.’ Whereas most Copts [Christians] have no difficulty acknowledging ‘Allah’—which is just Arabic for ‘God’—‘his Prophet’ is more problematic, as it is an acknowledgement that Muhammad is indeed the prophet of God. Any Coptic physician publicly reciting this oath places his or her religious identity in danger, as this would represent an implicit conversion to Islam.” The fear is that such wording may increase the chances of Christian doctors falling afoul of more zealous Muslim colleagues or patients: on hearing a Christian professes Muhammad as Allah’s apostle—that is, essentially profess the shahada—physicians may be harassed to follow through and embrace Islam. To be a woman in a country where most of her people see women as a disgrace, and at best look at her from a sexual point of view, it is a heavy burden, but even worse when you are a Christian woman. It is hell!…. Sexual harassment can be described as an epidemic that spreads throughout Egypt. According to a 2013 study by the United Nations, more than 98 percent of all Egyptian women have been subjected to harassment. But the study did not show how harassment differs from a woman wearing hijab to another who reveals her hair. Most Muslim women in Egypt wear hijab and therefore, the others who do not wear it are most likely Coptic. This means that the Egyptian man thinks he has the right to harass her, simply because he sees her as a whore and a disbeliever. You may think that I am talking about a certain class of men, but in fact, most Muslim men (not all, but the majority) view the Coptic woman as easy prey. He thinks that he will have a religious reward if he can manipulate her emotionally and persuade her to marry him, or to convert to Islam, a phenomenon prevalent in Upper Egypt.